If you’re wondering what this Afrikaans word means it’s simply “fine bush”. Apparently this description originated from the early Dutch Settlers who were dismayed by the lack of timber on the bushy slopes, calling it “fijn bosch”. Although this name is appropriate it’s something Capetonians are rather smug about today, in fact the Cape Floral Region comprises mostly of fynbos. These plants are tough beauties that have learnt to thrive in nutrient poor soils, long dry summers, lots of wind and frequent fires. Many of their seeds require fire or smoke in order to germinate and some plants will only flower after a fire. Little Phoenixes indeed! Fynbos is an ancient vegetation type that was spared the massive wipeouts that occurred in the northern hemisphere during a prolonged ice age which only ended 100 000 years ago. Some of these plants date back to over 60 million years ago! This is one of the major factors influencing the amazing diversity of species. Basically they've evolved into four distinct groups; proteas, ericas, restios and geophytes. Proteas are the tall shrubs with big, feathery or leathery leaves and impressive blooms. The King Protea is South Africa’s national flower and can easily be spotted in Table Mountain National Park. The heath-like bushes with minute leaves and dainty bell-shaped blossoms are ericas. Restios are the reed-like grasses, which are the oldest plants in the region. Geophytes are the beautiful flowering bulbous plants that can be seen in the rainy season or after a fire. Numerous ground orchids like the spectacular flaming red disa and graceful arum lilies belong to this group. Walking through the fynbos is quite a sensory experience as it abounds with many herbaceous aromatics. The recently launched Estee Lauder fragrance, Beyond Paradise, contains floral and herbaceous notes inspired by fynbos plants. One of the most common pot plants around the globe, the sunny geranium, has been hybridized from the pelargonium. Other fynbos hybrids common to gardeners are daisies, freesias, gladioli, lilies and irises . 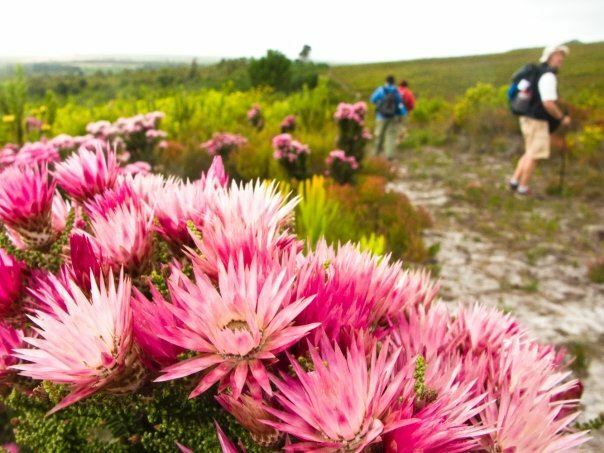 A great place to go and see fynbos is in the Kirstenbosch National Botanical Gardens in Cape Town. There are numerous reserves in the Western Cape which protect endemic species of fynbos, both coastal and mountainous. 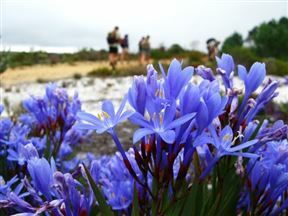 Fernkloof Nature Reserve in Hermanus is an excellent place to view the delicate montane coastal fynbos.